Think of a plant where the owners of a company have acted harshly and unfairly to their workers while the union leadership has been passive or even complicit in this treatment. Many workers have resisted, downing tools for a few hours and occupying a section of the plant for a few days. Finally, with a new collective agreement coming up, the workers elect a radical new union leadership team. The negotiations drag on for many months, and ultimately that leadership calls a strike vote that gets an overwhelming show of support. Faced with imminent closure and concerned about their members’ jobs, the new union leadership reluctantly signs off on a new collective agreement that includes even harsher language than before. They do not sugarcoat what has happened: “It is a bad agreement, but it kept the plant alive.” Although the new union leadership remains popular, many members are upset, shout “betrayal,” demonstrate in front of the union office, and demand that the plant be taken over and run by the union. The union leadership says this is not going to work: leaving aside the likelihood of the police being called in by the owners, there is the problem of cancelled contracts, lack of investment funds to convert the plant for other, more viable uses, and so on. Analogies are always limited. Greece is, after all, an independent state that notionally controls the fate of its economy. However, what makes the analogy apt is that the radical Syriza government was elected in January based on its promise to try to bargain a better deal than the severe neoliberal austerity imposed through the memoranda signed by previous governments. At the same time, it promised to remain in the eurozone monetary system, in which Greece’s financial system is embedded, as well as within the framework of the European Union, into which its economy has been integrated. The new government’s election was conditional on its making both these promises simultaneously, and the negotiations it entered into were a test of the compatibility of these two promises, as was the July 5 referendum it called and won so overwhelmingly after five months of fruitless negotiations. The charges of betrayal being levied against the Syriza leadership today are based on its signing off on the latest very harsh memorandum. But insofar as this memorandum was imposed on the basis of the threat of expelling Greece from the eurozone and leaving its banking system without support, the claim that Greek Prime Minister Alexis Tsipras “capitulated” implies that there was a viable alternative centered on an immediate eurozone exit (“Grexit”) that the government could have undertaken. 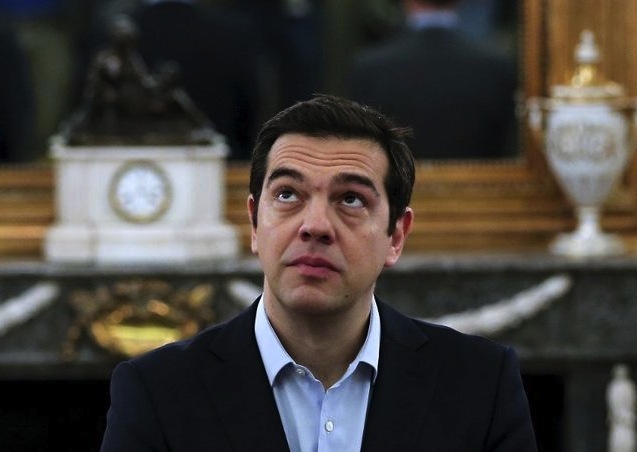 The political conditions that would make an immediate Grexit viable are not present today. Those who insist that these political conditions were established by the outcome of the referendum are being disingenuous. The latest poll, conducted by the reputable Palmos Analysis from July 15 to 17, shows that even taking into account the harsh new memorandum, 74 percent continue to support staying with the euro — and this includes 66 percent of Syriza supporters. At least 42 percent of those polled after the signing of the new memorandum indicated they would vote for Syriza today, a substantial increase over the 36 percent in the last election. This gives Syriza more than a 20 percent lead over New Democracy, which is in second place, and would yield a clear majority of the parliament’s 165 seats. Given his massive popularity, Tsipras might, with an enthusiastic campaign, have tried to increase support for exiting the euro, but even getting that to a bare majority would require more than doubling current support for returning to the drachma, which stands at only 24 percent. Tsipras has always made it very clear that he — and this applies to the majority of the party’s leadership at every level — would only go as far as the Europeans would let him. He was elected on this basis and conducted the referendum on the same basis. Those who now traduce him for not doing an about-face are now effectively admitting that they should have backed the Greek Communist Party (KKE) or the Antarysa positions all along, rather than enthusiastically backing Syriza’s election. Tsipras’ credibility is based on his insistence — antithetical to a union leader selling concessions as a victory and therefore doing the work of the company — that the deal is bad. He presents it as being forced not just on him but on the Greek people by the troika, above all Germany. We have chosen a compromise that forces us to implement a program in which we do not believe, and we will implement it because the alternatives are tough. We are summoned today to legislate under a state of emergency. The presence of the left in this government isn’t about the pursuit of office, it’s a bastion from which to fight for our people’s interests. And as far as I’m concerned, I won’t abandon this bastion, at least of my own free will. It must also be said that the Left Platform’s advocates for an easy immediate Grexit are not very persuasive. They assume that existing state institutions could be readily bent to the will of the government, let alone be adequate to carrying out the plan. And even if the Left Platform’s plan for Grexit was efficiently applied, it would most likely cause severe transitional hardship for a significantly longer period of time than the advocates of the plan say it would. Any serious alternative would need to consider the political consequences of this, especially if it had the effect of alienating Syriza’s supporters. Those who — like ourselves — believe that leaving the eurozone will eventually be necessary must acknowledge that this cannot be done immediately. A base for leaving must be developed, and this means taking the time to prepare for exit. The continuing support for Tsipras suggests that there is time to deal with creating the necessary transformations within the state, and the creative plans that both maintain confidence in the government and allow people to organically learn why they need to move beyond the limits of integration within a neoliberal Europe. Most of those who now support Tsipras do not propose to simply wait for European institutions to become “better.” They see the struggle in terms of an internationalism based on each country adding to the “little fires” that Syriza started and which will lead to changing the European Union. Others see the need for a rupture but want a far more elaborated and extensive plan for an economic transition than the Left Platform has advanced. The central problem is that even the most detailed plans now being advanced are presented as a set of alternative policies, but in fact amount to demands for an immediate political revolution. They fail to confront whether this is possible given the balance of forces inside Greece, as reflected in mostly unreconstructed institutions of the state itself, as well as by the continuing public preference for staying with the euro. Concrete political analysis, rather than a technical response to a political problem, is what is needed in the present moment. The best that can be hoped for right now is the development of sharper clarity, even among those in Syriza who understand the need for a rupture, and the recognition that this rupture must go beyond simply a rupture with the euro — it must be a rupture with the European Union as a neoliberal free trade and free capital zone. The Left Platform’s Plan B shrinks from tying these two imperatives together. Moreover, the fact that it is presented as a set of policies that could be readily imposed from the pinnacle of the state reflects what most politicized social movement activists and creative cadre inside the party dislike about the top-down strategic approach of the Left Platform. As we have argued, a real Plan B would need to be designed with all this in mind, and it would need to include a political plan for improving both the capacities of the party and the government to better contemplate, and successfully lead, such a rupture through both the state and the society. Constructive pressure on the Syriza government should be oriented toward pressing Tsipras to inaugurate this new phase by actively linking the government and the party with the solidarity networks, with the aim of deepening and expanding them in every community in Greece. The real test for Syriza now will be its ability to do this, thereby transcending its current divisions, including accusations of betrayal against the Tsipras government, on the one hand, and attempts to marginalize supporters of the Left Platform, on the other. Removing the pressure from the Left would certainly undermine a crucial safeguard against the government becoming indistinguishable from mainstream social-democratic governments across Europe. But a far greater proportion of the party than is represented by the Left Platform, and this is true of the parliamentary party and even the cabinet, are determined that this should not happen. At the same time, no one should see the defeat of the Tsipras government or a split within the party as an “opportunity” for the Left. It would be a disaster that the political right, including the fascists, would primarily benefit from. The profound issues involved here require the international left to seriously confront the uncharted complexities of any democratic socialist strategy in today’s global neoliberal context. No party of the Left that comes into office anywhere today is likely to be as radical as we might like. What is the responsibility of the socialist left in these concrete circumstances? There will be disappointments; achievements will be partial at best and vulnerable to reversals; and there will be continual, renewed attempts to get them on track again. Ultimately, we know little about how to deal with this situation. Debates within the Left are absolutely essential, but they should be conducted without easy revolutionary posturing, and with appropriate modesty — because no one has easy answers in this difficult and complex moment.